Jagex’s new thing is a CCG “played out within the pages of a living book”, which unnerves as a concept. After all, who’s to know when a living book will snap shut on your fingers and slither off under a shelf to make a nest? Chronicle: Runescape Legends won’t do that, we’re assured – instead, it’ll do single player quests, boss fights with classic Runescape monsters, and bitterly-fought PvP. Chronicle is expected sometime next year on PC and Mac, as well as tablets and phones. The latter will presumably mean a break from the browsers that’ve been Jagex’s platform of choice to date. Set in Runescape’s Gielinor, the CCG announced at Saturday’s RuneFest will have us play out “miniature RPGs” in single player, before entering the competitive realm in multiplayer. Jagex have been working away on Chronicle since the start of the year, and say we’ll hear much more about it in the coming months. 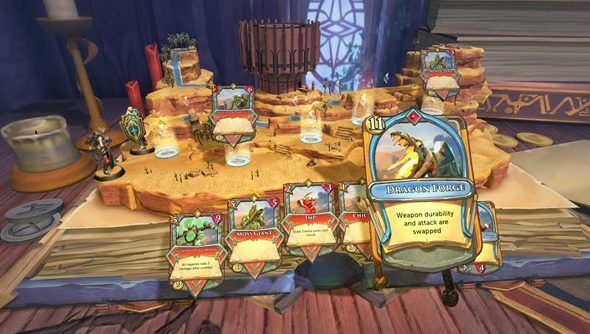 “We’ve been quietly developing Chronicle: Runescape Legends to ensure that it’s not only a fun and compelling player experience, but one still very much interwoven into the rich lore of RuneScape,” said lead designer James Sweatman. Chronicle finds Jagex on more comfortable terrain after the troubled inception and quiet reception of MMO-turned-MOBA Transformers Universe, which remains in open beta. Intriguingly, Runescape player numbers are growing like never before – even though the browser MMO is in its thirteenth year, and loomed over by a vast new range of free-to-play competitors. The recent addition of the Lost City of the Elves represented a triumphant fanfare – a reminder that Jagex’s flagship universe is alive and well. When was the last time you logged into Runescape?